VATICAN CITY (CNS) — The brutality of the First World War is a lesson that the world has yet to learn, Pope Francis said. World War I is a chapter in history that serves as a dire warning and a call for world leaders “to reject the culture of war and to seek every legitimate means to put an end to the conflicts that still stain many regions of the world with blood,” the pope said Nov. 11 after praying the Angelus with pilgrims gathered in St. Peter’s Square. In the early afternoon, the bells of St. Peter’s Basilica tolled solemnly along with church bells around the world to commemorate the end of one of the bloodiest wars of the 20th century. The conflict, which began July 28, 1914, and lasted until the signing of the armistice on Nov. 11, 1918, led to the deaths of an estimated 40 million people. Recalling the words of Pope Benedict XV, the pope said the Great War led to “the useless slaughter” of innocent lives and that the world must learn from its errors to avoid repeating the same mistakes. The world, he added, should learn from the “emblematic sign” of St. Martin of Tours who, according to legend, tore his cloak to share with a beggar only to discover in a dream that the poor man was Christ. 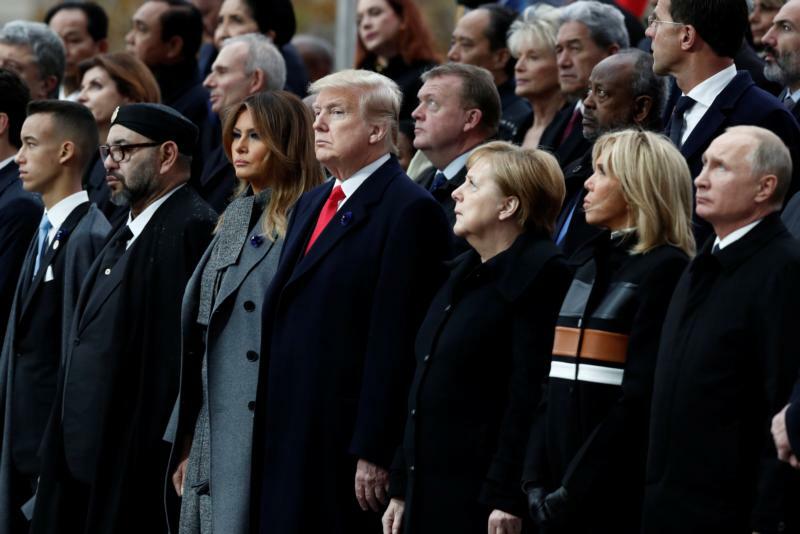 Earlier that day, world leaders and dignitaries gathered in Paris near the famed Arc de Triomphe to commemorate Armistice Day. Cardinal Pietro Parolin, Vatican secretary of state, was among the officials who solemnly processed toward the Tomb of the Unknown Soldier, a monument honoring the countless dead soldiers whose remains were never identified following the war. Also present at the event were U.S. President Donald Trump and First Lady Melania Trump, Canadian Prime Minister Justin Trudeau, as well as Russian President Vladimir Putin and German Chancellor Angela Merkel. In his address, French President Emmanuel Macron denounced nationalism as a “betrayal of patriotism” and echoed the pope’s sentiments on the reemergence of old rivalries and new ideologies that threaten the world once again.